We’ve been waiting for some time now to be able to wirelessly charge our smartphones, and now with Qi wireless charging, we’re finally able to. The Yootech Wireless Charger will do the job for you effortlessly for a fantastic price. 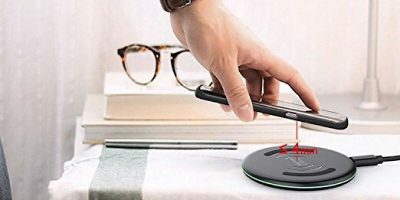 Need a simple, easy-to-use Qi wireless charging pad that doesn’t take up much space and features fast charging technology? Check out this one by Choetech. The Choetech T518 is a wireless charger that works with Qi-enabled and non-Qi-enabled devices (with the use of a wireless receiver). Here’s a closer look at its features and performance. Wireless charging has become a thing. But how much do you really know about the charger you’re using at your home or at a cafe? This article answers it all. Air Charge provides cool, simple & convenient wireless charging solutions for everyone. Here’s your chance to win your very own Wireless Surface Charger.